In June 2000, I was sent to Cambodia by Handicap International, one of the founders of the 1992 International Campaign to Ban Landmines (ICBL), to document the effects of landmines on the population. I discovered a country in extreme poverty, ravaged by thirty years of civil war  as a result of the successive French and American wars in Indo China and Viet Nam - and the vicious Pol Pot and Khmer Rouge regimes. I traveled on almost nonexistent dirt roads accompanied by an interpreter and driver provided by Handicap International. I slept in grass huts, or in a room I would rent from a farmer who had no income other than what I paid him for the night. Like everyone else, I learned very quickly to stay on the well-worn paths. One of my interpreters had only one leg, because he had blown up on a mine when he was a child. He took me to a twelve year old girl, another amputee, who was also missing some fingers. I photographed Savy sitting on the rickety ladder that led up to the door of her family's grass hut. She told me that she had blown up on a mine just 5 meters from that doorway in 1998. After the accident, Savy's father began to investigate. He took a long stick and burrowed under the earth around the family's house. He found 35 landmines. No one had imagined there were mines there, because no one had blown up on one before. I learned that this is often the only way people in areas affected by mines become alert to their presence. I met Than Svay, a farmer with four children, who lost his leg when he was a soldier. 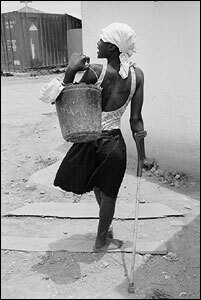 He fashioned a makeshift limb from a tree branch and used it for years before he learned of the existence of Handicap International and the possibility of a true prosthesis, free of charge. Srey Savuth drove me around on the back of his scooter to visit mine victims living in a refugee camp near the Thai border. Lena, a twenty year old amputee, crossed the border into Thailand every day to sell trinkets to support her mother and sister; Sem Sovantha lost both legs in a mine explosion near Phnom Penh that killed four of his friends and wounded two others. When I visited him with his wife and five children Sem sat casually on the sticks that made up the floor of his grass hut, balanced on the two stumps that had been his legs. He hauled out a battered, spineless dictionary, the pages held in place by string, and explained that he was learning English because he knew it was important today to be able to speak and understand the language. As we made our way through the refugee camp on my last day, we heard chanting. Srey told me it meant that someone had died. When we approached the sound, we could see an emaciated body laid out in front of the lean-to that served as a house for a family with four children. Neighbors and friends were building a coffin out of wood and covering the sides with newspapers. Monks dressed in flowing orange gowns, their shaved heads shining, sat around the body and ate a meal provided for them by the women. Underneath the cot where the dead man lay was a prosthesis. The man had died of AIDS  but was a mine victim from years before. His wife had already died and his mother, old and poor, had come from Thailand for the funeral. She told me she was unable to care for her son's four small children, now orphans. I took many pictures -- of the children washing their father's body, of the monks praying and burning incense, of the coffin being built, and finally, of the body being picked up and lowered into the coffin. I watched as the man's prosthesis was carefully placed on top of his skeletal form which lay wrapped in a sheet at the bottom of the crude wooden box. Then I followed the family members and monks who trailed after the coffin in a procession out onto the dirt road that ran above the refugee camp to the bare field where the cremation would take place. Over the next three years, in collaboration with Handicap International, I traveled to four more of the countries most ravaged by the presence of landmines. When I started working, I was ashamed to find to what extent I was repelled by the amputations. Stump -- even the word is repugnant. At first, I couldn't see past those knobs of limb that ended so abruptly. I found myself avoiding photographing the space that was left, a frightening space because I'd always known it to be something, an arm or a leg, and suddenly it was not. In the past two decades more than 360 kinds of landmines have been developed. Once on the ground, these weapons lie dormant until they explode, either upon contact, or under the pressure of weight. The most recent models are made out of plastic, on purpose, so that the metal detectors used by deminers are unable to discover them. They are often brightly colored and attract children who pick them up. They don't single out specific victims, but mutilate indiscriminately. In 2002, more than 85% of all landmine victims were civilians, many of them children. Landmines are conceived to mangle rather than kill. People who survive mine accidents are amputees. Thus disabled, they cannot work and become a burden for the society. The psychological effects of mine accidents are as traumatic as the physical. People so severely handicapped often find it hard to participate in the life of the society. They may be ostracized because of their disabilities. Families are weakened, people are marginalized, and the health-care system  precarious if not nonexistent in countries so poor  is monopolized by mine accidents to the detriment of other serious health problems such as polio, malaria, AIDS, or tuberculosis. When so many people cannot work, when the land cannot be farmed, the economy itself becomes disabled. Everything needed to rebuild a country  irrigation, infrastructure, resettlement of refugees after war  all becomes vastly more complicated if the country is mined. Cambodia, Mozambique, Kosovo, Angola, Afghanistan: my work took me deep into some of the poorest regions of the world: countries ravaged by decades of war and impoverished by ruthless dictators or corrupt politicians; countries mined by outside powers, then mined again by their own people during brutal, civil wars. 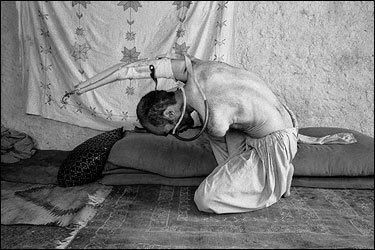 These places have been bled dry until all that is left are the people, extraordinary human beings who, against all odds, have managed somehow to survive  without legs, without arms, blind, mangled, with or without a prostheses, their children broken and mutilated forever.